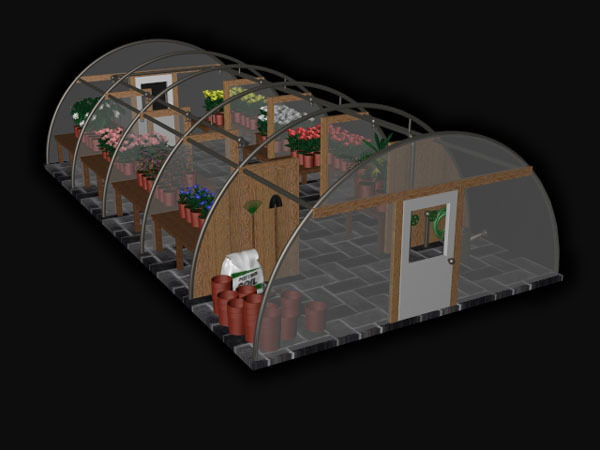 This greenhouse is one of several 3D buildings I created for the BayBank Regulatory Compliance Series CBT, while working at Oakes Interactive. One of the modules in the course contained several sub-modules, represented in the course map by a row of these greenhouses. Although low-detail exterior models (used in the course map) already existed when I took over the BayBank project on joining Oakes in 1997, I had to create these detailed interior models from scratch, using 3D Studio. These were used in the module menus and the module completion screens.